Founded In Switzerland in 2009, Alevo Group is an energy service provider (ESP). It’s also global in scale, and Cabarrus County landed it when Alevo purchased the vacant Philip Morris plant on NC Highway 29. 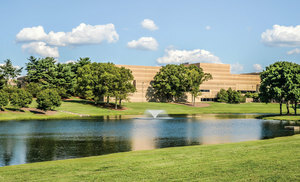 Now called Victory Industrial Park, it’s home to the firm’s first manufacturing facility. Alevo unveiled the plan for its new venture in October of 2014. 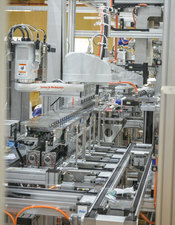 Now, almost a year later, it is on the cusp of rolling those first shipments of product off the assembly line. What’s interesting is that Alevo’s business is, in itself, philanthropic. And it’s all about electricity. According to company officials, the world wastes approximately 30 percent of all energy produced – energy manufactured from depleting fossil fuels and that consumers have paid for. Up until now, there has been no way to sufficiently store that wasted energy. Alevo has found a solution with mind-boggling renewable potential. Out of its Concord facility, Alevo will be manufacturing batteries that can be used to store electricity. The batteries are then assembled together in a container known as a GridBank. The GridBanks can be shipped anywhere in the world where there is an energy deficiency – or no energy at all – and be used to power an area for up to 20 years. 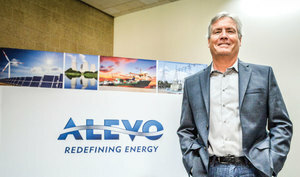 “The battery is safe, non-flammable and non-combustible,” Chris Christainsen, executive vice-president of Alevo, adds. Why Cabarrus County? Schotter says they looked at a lot of properties in many states, but their search wasn’t typical of some other corporations. “We weren’t looking for what many companies look for – namely, incentives – because we believe that real business needs to stand on its own without the crutch of government subsidies. What we were looking for was the perfect property to suit our needs. We…wanted a ‘ready to occupy’ plant so we could get to market faster,” he says. Indeed. The 2.5 million square feet of plant space coupled with about 1 million square feet of warehouse, all sitting on 2,000 acres, is prime for a manufacturer that, fully operational, could potentially produce 16.2 gigawatt hours (one GWh equals 1 billion watt hours) each year. It also didn’t hurt that Alevo’s close supplier, Parker Hannifin, is located in Charlotte. “We knew the area had a great local workforce, and the infrastructure of highway, rail and close proximity to ports all played into our decision,” Schotter adds. The workforce that Schotter mentions was key. When Philip Morris closed, nearly 2,500 local jobs went with it. Now Alevo anticipates that all 2,500 jobs will return to the community within the next few years…a built-in workforce. “We’re going to create a lot of jobs,” Eikland told the people of Cabarrus last October. closer to 200 – with anticipation of hiring another 200 or more in the near future. Last year, company officials said that one day the plant could boast as many as 6,000 employees; however, the goal at this point is to have 20 assembly lines running, which would necessitate 2,500 jobs. The question remains, however: How will Alevo’s batteries change the world? Schotter gave Cabarrus Magazine a simple explanation (as simple as possible). “Without getting too technical, our lithium battery chemistry is made of inorganic material. No other lithium battery in the world has the same properties; all others are organic. This means our batteries are non-combustible and non-flammable. Organic batteries have to manage these issues." “Unlike organic lithium batteries, there are no unpredictable side reactions in our batteries and there is no changed internal resistance over time. Increasing internal resistance is one reason why your cell phone battery dies. The upshot of this is our batteries last a long time. We are over 50,000 cycles and counting in our test batteries, which is well beyond any competitor batteries. This becomes meaningful when you load these batteries into GridBanks and tie them to the electric grid, because the grid is tough on batteries. In layman’s terms, the batteries that will soon come out of the plant in Concord could potentially light up a third-world region that previously had been lacking electrical power. They will be the means for the world to be able to store energy that would normally have gone to waste, and use it when needed. The implications of this product could be felt globally one day soon, but that’s no reason to rush things. Shotter adds that the first GridBanks have all been spoken for and they will be installed in the U.S. market and Europe. So now we wait for those first shipments, which Schotter says will hopefully come before the end of the year. Regardless, Cabarrus County may be the place where, one day, people will say the problem to the world’s energy crisis was solved. Time will tell.